We all have our guilty pleasures. Whether it’s designer handbags, digital gadgets or daily Starbucks Frappuccinos, we each spend our money in our own way, on things we enjoy. And as long as you’re sensible about these indulgences, there’s no reason to feel guilty about them. That was the key message from Angela Koszuta this week, at an event on affordable luxury. Thanks to her career as a fashion stylist for TV and print, and the writer behind the Toronto Star’s ‘Shop Like A Pro’ column, Koszuta spends much of her time shopping, and so she has plenty of advice to offer when it comes to finding value and scoring deals. At the event, hosted by Buick Canada, Koszuta outlined some of her top tips for living the good life, guilt-free. Since I’m personally a fan of sales and deals, I could relate to many of Angela’s tips and tricks for affordable luxury. Calculate your “price per wear”: A little basic math goes a long way. If that gorgeous leather jacket is $400, but you know you’ll wear it regularly for at least three seasons, it could actually end up costing less, per wear, than that trendy $30 top that you’ll likely wear only once. Online shopping: This is a bit of an obvious one, but do your research. A quick Google search lets you compare prices at multiple retailers, so you can check whether that dress might be 10% or 20% less at another store, before ringing in the sale. Outlet shopping: Why pay full price for designer goods when you can find them for as much as 80% off? When it comes to big purchases, it’s often worth the trek to the nearest outlet mall. And the GTA will soon be home to many new outlet options, with the brand new Toronto Premium Outlets opening next month (Bringing bargains closer to home). Buy timeless pieces: If you’re going to splurge on a designer item, choose one that will serve you well. Avoid spending a lot on a trendy item that will look dated next season; opt for one that you’ll be able to wear for several seasons to come. A high quality handbag in a neutral colour, for example, could last for years. Loyalty programs: Rewards can add up quickly, and since many loyalty programs are free (Indigo’s Plum Rewards Program, for example – Make room in your wallet for more rewards), there’s really no downside to joining these programs at the retailers you visit regularly. Bonus tip: Treat yo self. I couldn’t resist using this line from one of my favourite episodes of Parks and Recreation in the title of this post. In the episode, Donna and Tom spend the day splurging on the things they love. Since it’s something they do just once a year, they can justify these luxuries. So, take it from Donna and Tom. Once in a while, go ahead. 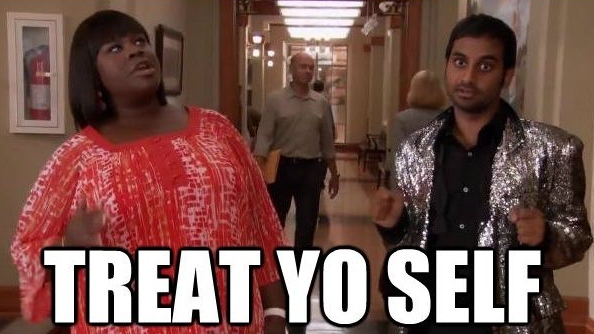 Treat yo self. Outlet shoppers and bargain hunters, brace yourselves: you’ll soon be able to stay far closer to home when shopping your favourite brands. In a few short months, a shiny new outlet mall will welcome to the GTA a variety of brands that have never before brought their outlet stores to Canada. Toronto Premium Outlets is slated to open on Aug. 1st in Halton Hills, near Trafalgar Road and the 401. An artistic rendering of the Toronto Premium Outlets. Developed by Simon Property Group and Calloway Real Estate Investment Trust, the new retail hub represents the first Premium Outlet Center to open in Canada. The upscale outlet mall concept has done well in U.S. markets and abroad, as Simon has continued to expand its roster of more than 300 malls. With easier access to these and other brands, many Toronto-area shoppers may be taking fewer trips to the U.S. once the new shopping hub opens its doors. As a result, outlet malls south of the border may begin to see fewer Canadian shoppers browsing their offerings. In particular, Fashion Outlets of Niagara Falls – a popular destination among Canadians given its close proximity to the border – could see its traffic decline given that many of its retailers will now have Canadian locations. Whether the merchandise offerings and prices are on par with the U.S. stores, however, remains to be seen. In addition, the shopping centre will be anchored by the first ever Hudson’s Bay Outlet – something I’m personally curious to check out. Since The Bay has spent the past few years continuously improving the quality of merchandise it carries, an HBC outlet could be a good place to scoop up some high-end brands at affordable prices. If you’re a fan of Michael Kors and you haven’t yet checked out the new outlet store at Vaughan Mills, take my word: it’s worth the trip to Vaughan. I stopped by the store last weekend, and ever since, I’ve been kicking myself for not taking advantage of the great deals that this store has to offer. Michael Kors handbags are my latest accessory obsession, and so it was no easy task keeping my credit card in check in a store full of these gorgeous bags, all marked down in price. I love the simple yet classy look of the handbags – especially the leather tote bags and the large Edie shoulder bags. The Michael Kors Large Tote, in black; one of my favourites. The outlet also has a decent sized selection of clothing, as well as some accessories and small leather goods, also discounted in price. My only complaint about the outlet store is its location, which is a little too far from the city for me to be stopping by as often as I would like. Based on the crowds of people browsing the store on Sunday, however, it appears that many fashionistas are more than willing to make the trip. If you appreciate Michael Kors’ designs as much as I do, I definitely recommend checking out this GTA retail gem.